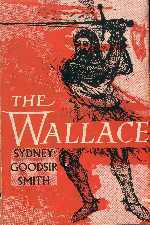 will be performing the play 'The Wallace' by Sydney Goodsir Smith at the 2001 Edinburgh Festival Fringe. The production is directed By Charles Nowosielski, with Musical Director Richard Cherns. There will be live music, with performances staged in the atmospheric outdoor setting of the Manse Gardens. Sydney Goodsir Smith was born in New Zealand in 1915. He first came to Edinburgh in 1927, and lived there much of the time thereafter. He was educated at the Universities of Edinburgh and Oxford. As a writer he was always closely associated with the Scots Renaissance, the literary movement founded by Hugh McDairmid soon after the Great War. Originally best known as a poet, The Wallace was the first of his plays to be performed and published. It was broadcast on the BBC Scottish Service on 30th November 1959, and presented at the Assembly Hall in Edinburgh at the 1960 International Festival. "The story of Wallace," wrote Robert Burns, "poured a Scottish prejudice in my veins that will boil along there till the floodgates of life shut in eternal rest." Sydney Goodsir Smith believed that a playwright must be first and foremost a storyteller; and in this stirring heroic drama he tells "How glorious Wallace stood, how hapless fell," but how, in the end, he triumphed over the renegade Scots Lords who had failed him at the Battle of Falkirk, the "fause Menteith," and Edward I of England, "Hammer of the Scots".